Since their origin, vampires have fed on humans, as we do on cattle and wild animals, hunting us for sport as well as food. They’ve come and gone as they pleased, unseen, legendary. 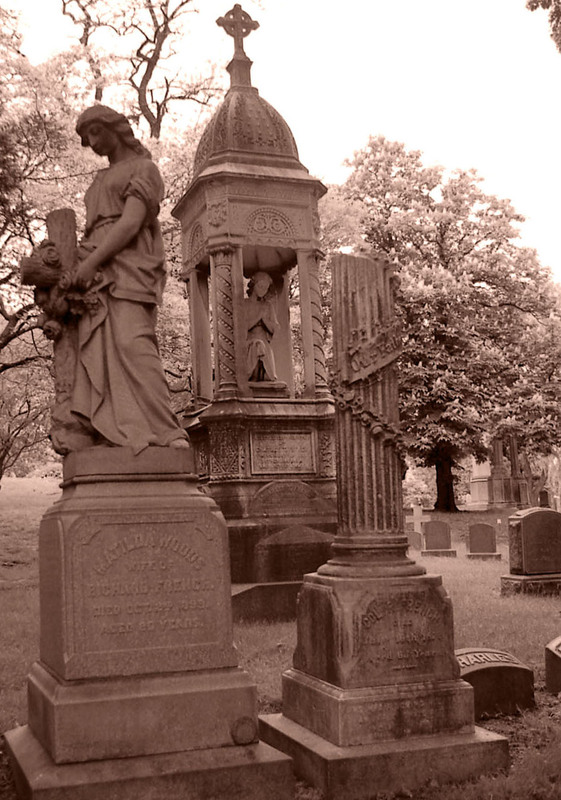 There was a time when your neighbors believed in them, came to your aid with torches, stakes and shovels to dig up the dead and put them to final rest. But as science grew stronger, so did disbelief in the things that science could dismiss with easy explanations. Allergies to light. Blood deficiencies. Dementia. Premature burial. Our lack of belief in vampires has always been their greatest weapon. You can’t organize resistance to something no one else believes in, as many victims of vampires have discovered over the centuries. Humans have battled them in secret ever since vampires spread through Europe like a plague after the Crusades, hiding in Eastern Europe, feeding there in secret, building up strength and allies until they could escape into the new growing cities, early urban centers finally becoming large enough to conceal the vampires and their crimes. But modern science is learning that there are more things than even it can explain -- quantum physics, string theory -- as vampires have become spoiled and complacent, careless, humans have become increasingly aware of their traces. We are prey no longer. The balance of power is shifting. 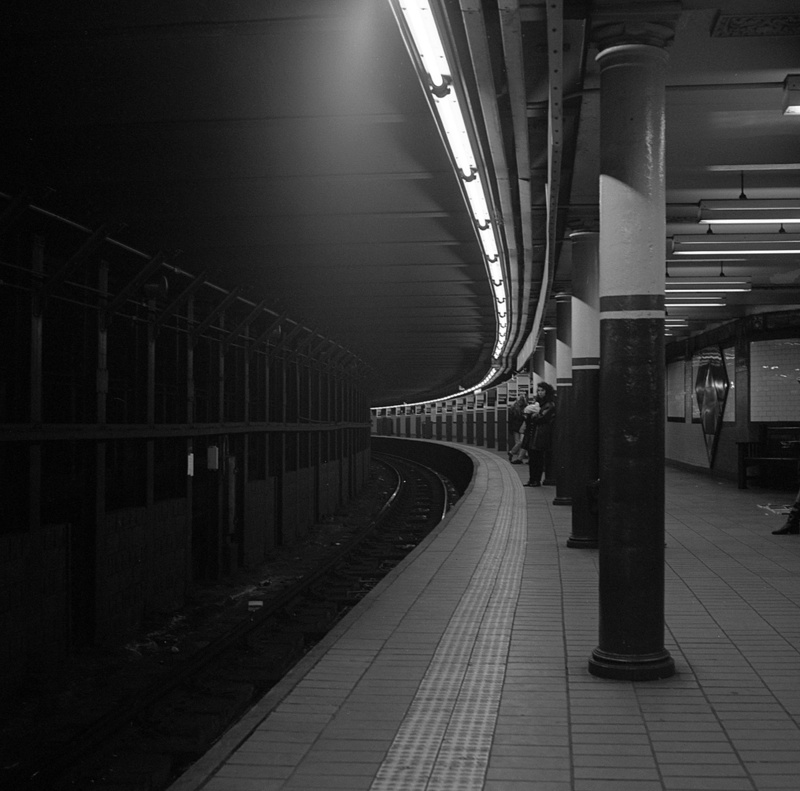 When incontrovertible proof of the existence of vampires was discovered in 1987, on the Lower East Side and midtown of Manhattan, organized resistance began in earnest with the formation of Clean Slate Global, based in Red Hook, Brooklyn, a private mercenary organization dedicated to wiping them out -- for a price. By 2007, the secret war between vampires and humans had officially begun with the capture of the elected members of New York’s High Council of the Society of the Veil, the hundred vampires who ruled the rest. From that day on, man and vampire have been locked in deadly battle, even if no one has known about it but the combatants. This is the world of The Vampire Testaments, an epic urban trilogy that follows three generations in the continuing battle, beginning with the first verifiable evidence of vampire activity in New York City, 1987, continuing through the escalation of the secret war when it’s officially declared in 2007, and climaxing with what may or may not be an uneasy resolution of the conflict in 2028. Essentially it’s a single story told in three parts — BITE MARKS, BLOOD PRESSURE and PAST LIFE, collectively titled THE VAMPIRE TESTAMENTS — told from the points of view of the vampires and humans at the heart of the conflict. 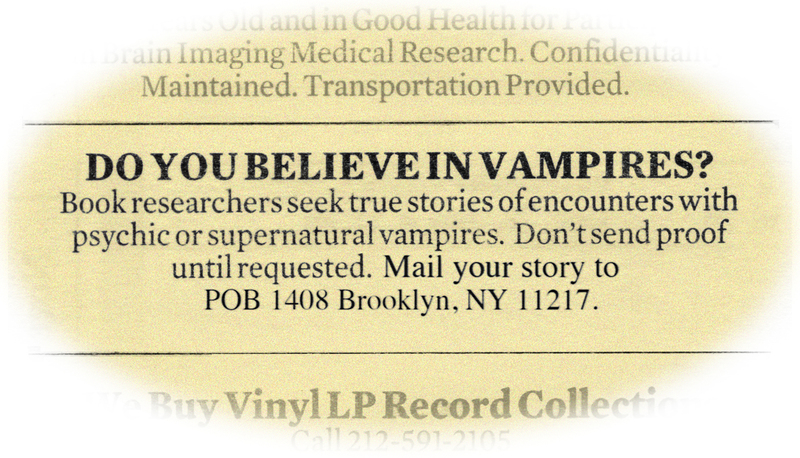 The first novel, BITE MARKS: A Vampire Testament, opens with the fictional ad above, clipped by a vampire's victim from the back page bulletin board of the Village Voice. I'm not saying I do believe. I'm not saying I don't. But the question I asked at the beginning of the first book haunted me while I wrote BITE MARKS. I was immersed for almost a decade in creating a nocturnal world of potentially immortal beings with abilities beyond human, vampires with lives that spanned many human lifetimes. Creatures with time to consider the great ideas of the ages. Time to grow, to learn, and see the world in perspective. Time to live. Time to love. I began this website to promote my books and talk about the experience of being a newly published author, but it soon occurred to me that it was also a good way to explore the questions that arose while I wrote the novel, as I created my own vision of what their lives would be like. This site is an experiment, an exploration of my digital boundaries as I build it, but also of my curiosity about the worlds I write about. I work in horror. I don't live there. I like -- and need -- a good laugh several times a day. But I can't help wonder what's happening in that world when I shut down my computer at the end of my day. I'm not inviting it in -- just trying to bring the vision into sharper clarity. What is a "true" vampire? What are they like? What if somewhere out there right now, a being who's lived many times my lifetime is reading these words and smiling, knowing the truth? What if they are real? If so, someone must have met them, seen them or their traces, and lived to tell the tale. Tell all of us what you've seen. Go to the Vampire Encounters page and share your experiences. If you have more to tell, pictures or video for me to share, go to Contact and e-mail me. Let's start to put together the pieces we have, share our stories about real world vampires we have met, supernatural, psychic, and otherwise‚ and see what we shall see. As my characters say in their ad, "Don't send proof until requested." As I gain information I'll share it. If there is none, I'll shut this site down and breathe a sigh of relief. Until there is an answer one way or the other, enjoy my idea of what vampires could be like, and how they might deal with each other, and us, in The Vampire Testaments. Once the establishing trilogy concludes, the Testaments will continue, as I follow the lives of my vampires over the centuries that led up to the war, tell tales of the build-up and course of the decades-long conflict, and of the changes in our world in the future after their existence is revealed.